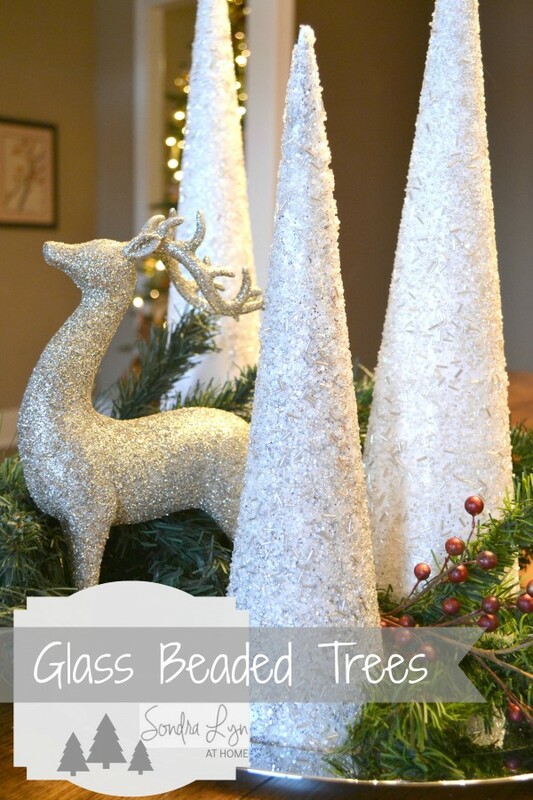 Have you seen those gorgeous glass beaded trees? The ones like they have at Frontgate for $129.00 for the set of 3 (on sale from $179!). I wanted them SO badly! 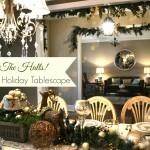 I love natural materials for decorating, but sometimes you just can’t beat glitz and glamour! I do love me some sparkle!! 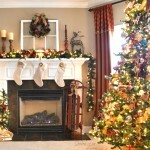 While shopping, I found some similar trees at TJMaxx, but they were still more than I wanted to spend (about $75). So I decided to try my hand at making the cones myself. 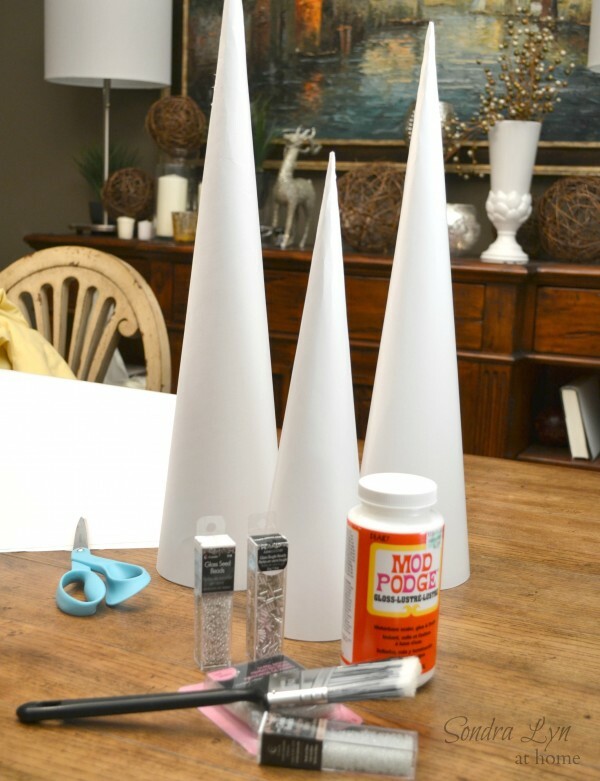 I found this great tutorial online for making the cones out of poster board and I made 3 cones of varying height in no time! They weren’t difficult, and didn’t have to be perfect, since they would be covered with gorgeous sparkle! My plan was to give the cones a good coating of Mod Podge and then shake the beads on. I used a foam brush to apply the Mod Podge as thick as it would go (the brush in photo above didn’t leave a thick enough coating of MP). Then all I did was combine the beads in a pyrex cup and, holding over a piece of poster board, gently shook beads over the cones, turning as I went. I did the tops first and let dry, then went back and did the bottoms. After covering each cone with beads, I shook the excess from the poster board back into the pyrex cup. About a pound of beads should be enough to do three trees this size. 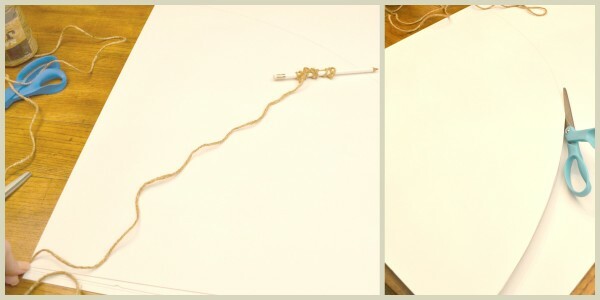 After the Mod Podge has fully cured (like a day or so), I will spray with a sealer spray to help prevent any bead loss. I am so thrilled with the finished product! This project came in at under $20 for all three trees! And I absolutely LOVE them!! 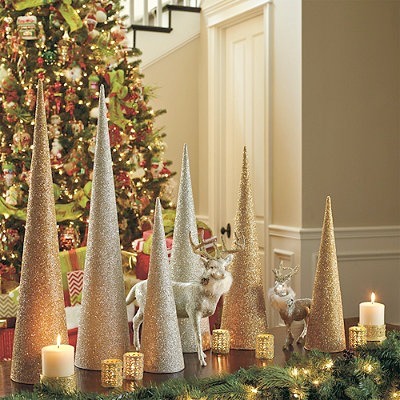 Great tutorials on how to make Christmas cones. I am going to try this. Thanks. They are pretty easy to make! And thanks so much for stopping by… hope you’ll visit again soon!! Would you please tell exactly what kind of glitter you used? 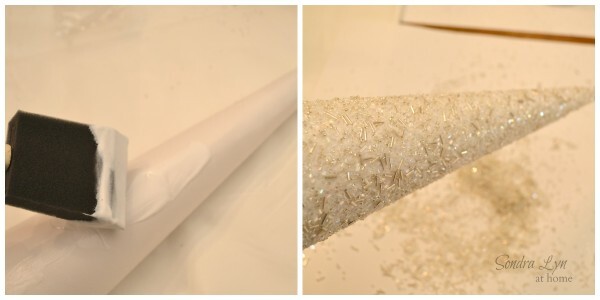 There are many instructions on how to make these trees but the most important item is left out: the kind of glitter. Thks so much. Hi J.! Thanks for popping by! As I stated in my post, I used glass beads and Mod Podge to adhere them. To finish, I used spray-on glitter in silver. 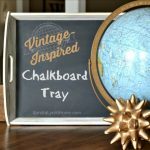 These look beautiful, and now I have to make a trip to Hobby Lobby so i can make my own 🙂 I hope you will share this post on Thank Goodness It’s Thursday at http://www.jordansonion.blogspot.com – the party goes live on Thursday at 10am MST. Thanks, Jordan… so glad you like them! And I’ll be happy to share!! great idea sondra. I am doing these. maybe even this week. very exciting. LOVE these! 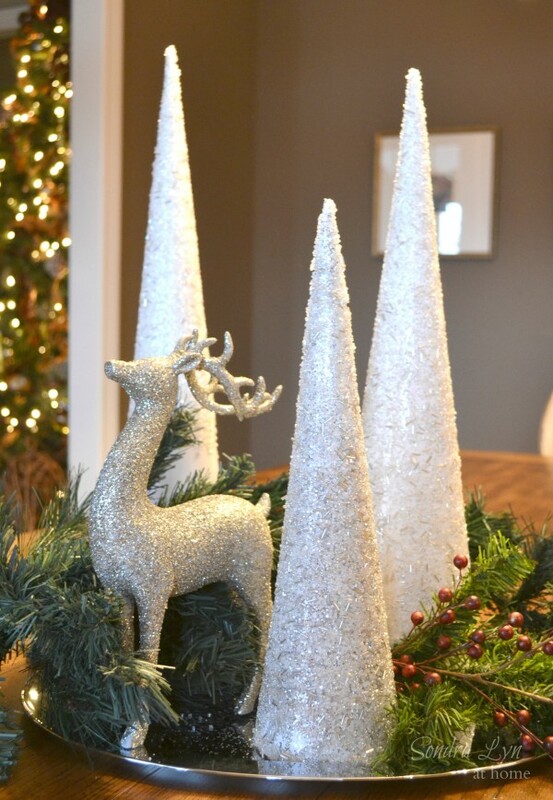 I was looking for something like this for a wedding reception I’m doing with a Winter Wonderland theme– thanks! So glad you like them! I will amend my post, but do seal them somehow… either with more Mod Podge on top of the beads (it dries clear) or with a spray sealant… just to help the beads to not shed, especially if you will handle or transport them a lot. Could you use a foam tree shape? Yes, you could. In fact, I had bought some. But they were pretty expensive, esp. The larger ones. And they don’t come to a point at the top, so I opted to make the cones. What beads, I can only see the lg. glitter pieces? ?Can you tell us where to buy the supplies needed, PLEASE!! These are glass beads that can be found at craft stores or here on Amazon https://amzn.to/2Ra37o8 OR https://amzn.to/2CY3TkT. These look like fun to make! But what is Mod Podge? Could I use PVA glue? I would imagine you could also use styrofoam cones as well.